Often we are admonished against borrowing and ballooning our debt levels since debt is viewed as a bad idea especially for the middle and low income earners. The reasons for such kind of precaution are obvious since with high debt levels you will find yourself trapped in the rat race. This is a situation whereby you earn your monthly income to repay debts with all of it; and then borrow more money to spend in the next month and wait for end month again to earn and repay the new debt. As this cycle continues, you find yourself trapped in employment since you need the regular income to repay the debts, yet your income is not resulting to any significant economic development for yourself and your family. The most common form of debt that traps most people in the US is the credit card debt. According to the NerdWallet Report, an average US household has about USD 16,000 in credit card debts as of December 2016. This figure almost hits the highest level experienced back in 2008. When mortgage loans are added to the credit card loans, the average household debt in the US stood at about USD 133,000 in 2016; up from about USD 88,000 in 2002. The situation is worsened by the fact that income level s are not growing at the same pace as the debt levels; creating a worrisome scenario whereby many households are prone to being bankrupt if the excessive borrowing is not contained. 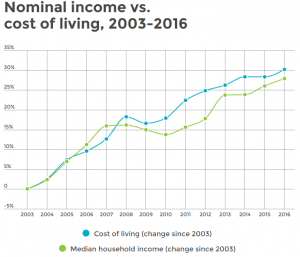 In the past 13 years, average household income has grown by about 28%, while the cost of living for a typical US household has gone up by about 30%. 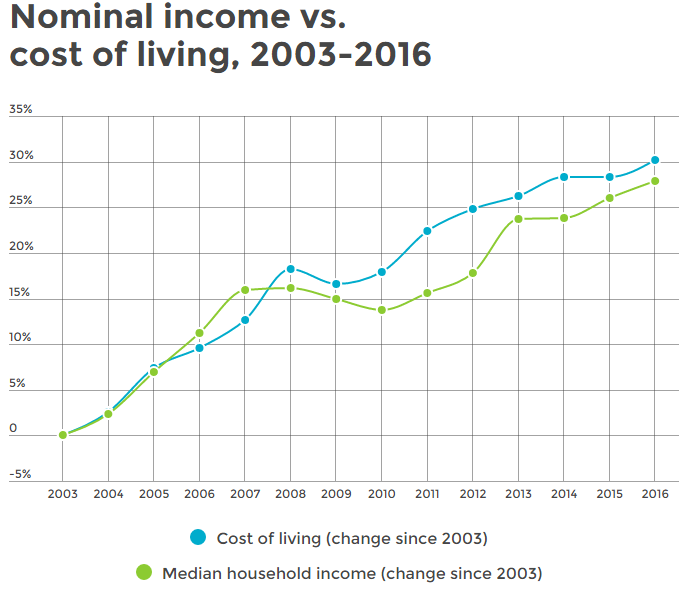 Specifically, medical expenses jumped up by about 57% since 2003, housing costs went up by about 32% and the cost of food shot up by about 36%. With the unmatched growth between income levels and cost of living, US citizens are left with the option of using their credit cards to fill in the gap in order to access the basics of life and a little bit of luxury. Having the current average interest rate on credit cards standing at about 18.76%, the increased use of credit cards leaves a typical US household with an additional credit card loan interest bill of about USD 1,292 per year. This additional cost can get out of hand if not well monitored; hence the need for you to check your credit card report regularly in order to know how much you are spending on credit card loans and take corrective measures. Besides the ugly side of the credit card debt, not all debt is bad though. The wealthy understand the term leverage and how to use it in their wealth creation strategies each day. Essentially, what the term leverage means to a financially prudent individual is that you make use of other people’s money to create wealth. This comes in form of borrowing loans from commercial banks where an average citizen has saved their money and using the loan to fund your investment projects. You then repay back the loan after you have already made much more money through the investment you made using the borrowed funds. The whole process is a well thought out venture where the risks have been calculated and the returns have been accurately projected to be way above the cost of acquiring the loan. The above example is more inclined to a business minded person and not very important to a person who prefers to be employed and earn a regular income. However, for such a person too, debt can be a good investment; in this case getting a student loan to advance your education with the hope of getting a better job with a higher salary. If your education plan is well strategized, getting the student loan is positive thing since it will in the end result to a higher income which hopefully translates to higher living standards in the long run. The returns from the student loan are therefore higher than the cost incurred in when repaying the loan, hence making the student loan a good idea. A mortgage can also be a good loan if the interest rate is affordable. There are two ways you can choose to pay for your house; one is through a mortgage and second you can choose to buy it cash. If you choose to buy it cash then you will have to save for a long period of time before you can raise enough money to buy the house. In the meantime, you shall be paying rent on a monthly basis on a house that you will not eventually own. Alternatively, you can choose to pay monthly mortgage equivalent to your current rent for a house that you will eventually own after several years. The money you shall be saving can then be utilized in other investments to continue growing your wealth over the years. By the time you finish paying your mortgage, your savings and investments will have grown tremendously to support your decent and comfortable lifestyle with minimal or no debt repayments thereafter. Depending on how you look at it, debt can be a good or a bad idea. But for you to make debt a good idea, utilize it in an investment that will produce higher returns in the long-run compared to the cost of acquiring the debt. If you’re like the rest of North America and think that housing is reaching unaffordable levels, the truth is that you’re right. However, that’s not even the whole story. Most people gage the affordability of a property based on the list price. However, what they don’t know is that there are a lot of hidden costs associated with buying a home which further raises the price, from legal fees, land transfer taxes, home inspections and moving costs. One such masked expense that you don’t learn about until later is that of mortgage insurance. Mortgage insurance offers comprehensive life, disability, and illness coverage on your financial obligation. That means that if life deals you a poor hand and due to serious illness or disability you cannot pay any more of your mortgage, the lender works with you to either suspend or forgive your debt. Death is an extreme example, but it means that if you pass away, your family will not be obligated to take on the remainder of your debt. This is extremely important to have in these critical situations. How much you’ll be paying in mortgage insurance depends on a few different factors that also vary in certain geographical locations. The main factors are how big your down payment is, how long your mortgage is amortized for, as well as the property’s location. The range can be from 1.75% to 2.75% of the purchase price, a sizeable expense for most home owners. However, you’ll also find that different lenders will offer you varying mortgage insurance rates. Who charges you for mortgage insurance? When you approach your lender for a mortgage, you’ll see that mortgage insurance is automatically added to your monthly payment plan. Most banks and private lenders provide their own mortgage insurance service. However, what most people don’t know is that there are third party mortgage insurers which often can have better options and rates for you. Must I go with my lender’s mortgage insurance? As long as you have mortgage insurance from a legitimate insurance company, a lender cannot refuse to give you a mortgage on the grounds that you didn’t select their in-house mortgage insurance. If you are shopping around for a mortgage with a broker, tell him or her that you are also interested in getting a good rate on your mortgage insurance. Even if you already have a contract for your existing mortgage, most lenders and banks allow you to cancel them without any additional fees or penalties. How much can I save by switching mortgage insurance providers? The amount of money that you save monthly depends on your current mortgage insurance as well as the size of your mortgage. The savings can range anywhere from $8-$65 a month which can add up to a lot over the course of the entire repayment period on a mortgage. It doesn’t hurt to check the mortgage insurance market, and in some cases your current bank might even match the rates that you had quoted from other places just to hang on to you as a client. Saving money has never been as important as it is now that the affordability of real estate is being questioned. Shopping around for the best mortgage insurance for you is one way that you can curb those extra costs that end up pumping up the price you paid for the house itself. Now it’s time to find a reasonable home inspector, real estate lawyer, and start making those mortgage payments on your new home. Congratulations! Those citizens in debt need to just sit down and think about possible solutions. The longer they carry debt, other perhaps than their mortgage which should be a positive aid to building up an asset, the less chance they have of saving for the future, whether it is to build a justrightinstallmentloans.com emergency fund or retirement. Saving can become a habit; some got that from an early age as children, others have never saved in their lives, spending what they earn each month. If you believe it is impossible to save you should ask yourself a few questions. The first might be how frequently in the month you eat out? If you eat out weekly then if you cut that down to three times a month then you will have a minimum of $50 which you can save. If you are still in your 20s you will be surprised with compound interest how quickly $50 a month grows even at fairly conservation annual growth. If growth averaged 8% per annum then your retirement pot could look very healthy indeed come retirement age. Clearly you do not have to be earning a huge salary to be able to provide properly for your later years. A 401K is essential; employers will match your contribution up to a certain amount. There are tax benefits involved in a 401K in addition. If you do not understand that then there are always financial advisers who can help. Retirement should be a time when people can enjoy a comfortable life after years of working. Health may become an increasingly important issue of course but people are living longer and so it is difficult to know how much anyone might need to guarantee they can be comfortable. The Social Security System is something that a large percentage of people are relying on to provide for them but therein lies a problem. More people are claiming benefit and for more years while fewer are contributing. There needs to be an injection of funds which realistically means higher taxation. That is unpopular in Congress at present but in the absence of more funds, estimates suggest that benefits will need to be cut by up to 25% by the mid-2030s. While common sense suggests that funding will be found from somewhere it does highlight the danger of over reliance on the System and not making private provisions. This highlights the problems associated with debt, particularly debt on credit cards which is particularly worrying. Those carrying debt on their cards over a period owe an average of just over $16,000 each. A high rate of interest is applied to these balances. Those who simply pay off the minimum each month will hardly be reducing their debt. Prior to the recession there was plenty of opportunity to switch that debt to a company offering 0% balance transfers; there are less available today. Similarly companies simply seemed to increase credit limits as people reached their existing ones without any deeper analysis. They are less complacent these days and there is every chance of an increasing number of people having their access to further credit card credit cut off. A consolidation loan may be the answer. Personal loans, even for those with a poor credit score, are available for those that have regular income and appear capable of paying instalments for the full term of the loan. Online lenders are less concerned with credit score than affordability. The point is that the rate of interest applied will always be lower than that the credit companies charge. It makes sense to look at other possible savings as well. The $50 saved for not eating out that once described above can be augmented by possible savings made by shopping around. Utility bills, telephone charges and insurance costs can all be significant parts of anyone’s monthly expenditure. Each is worth investigating and comparison websites are a good place to start. Even if you do think you have the opportunity to earn more there are certainly ways to reduce debt and create a surplus each month that can be put to positive use. It is surely worth doing as a matter of urgency if you want a comfortable retirement!